Late summer with its bountiful harvest of rich blackberries, plums, and all kinds of soft fruits – in a way this time of year makes me sad, sad that summer is nearly over, with that bittersweet yearning you get for missing out on something, the sense that summer is coming to a close. But also there is the excitement of the new (school) year to come as well. This blackberry oaty traybake is a delicious way to enjoy the fruit from those heaving bramble bushes, whether you’ve picked them from a nearby field or lane, or a pick-your-own farm or even just from the nearest park. 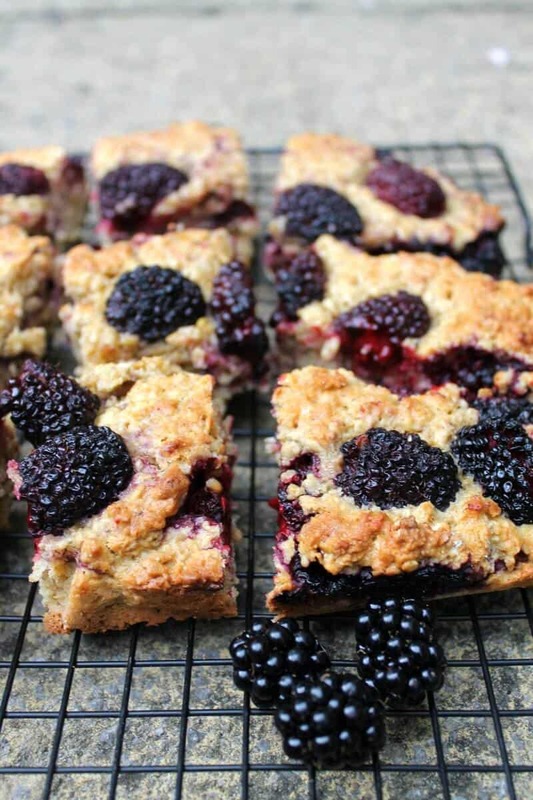 Oozing with blackberry juice, this blackberry oaty traybake or sheet cake is perfect sliced into squares and packed up for a picnic or added to a lunchbox. Using oats in a cake makes it feel much healthier than your usual cake, in fact it would also work well for breakfast. Cake for breakfast = winning! 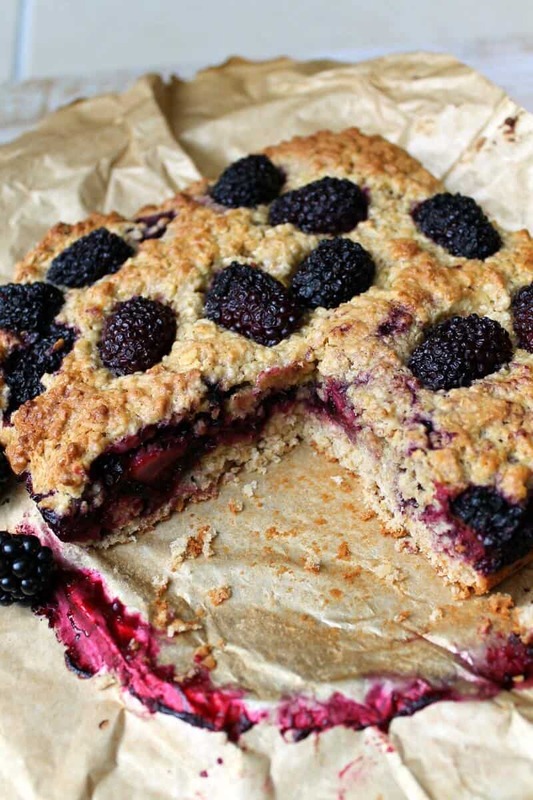 Not quite the same as a flapjack which is denser and more chewy, this is a light oaty cake with a layer of mashed blackberries through it. As you slice through the deep red of the blackberry layer inside is revealed, it makes the cake juicy and soft. I tried this combination of ingredients after picking up some lovely blackberries at the supermarket. An open packet of oats was calling out to be finished off in my cupboard, and knowing that oats can be made into flour using a food processor, I thought I would see how it would turn out. 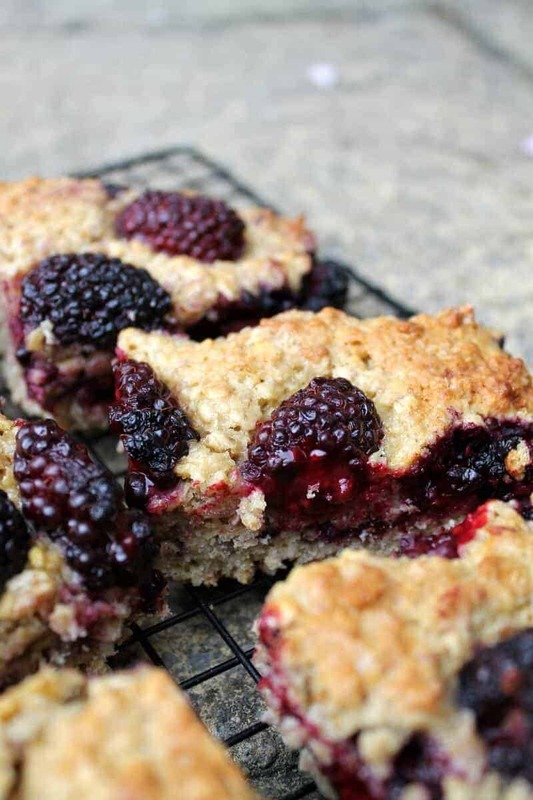 Not having a food processor to hand, I used them whole in my blackberry oaty traybake. How happy my children were to see I had been baking! They love picking blackberries if we spot brambles down at the park as well as at our local pick-your-own farm. Those juice-stained faces and hands are always a dead giveaway that they’ve been trying a few samples! That deep red juice just oozes out. 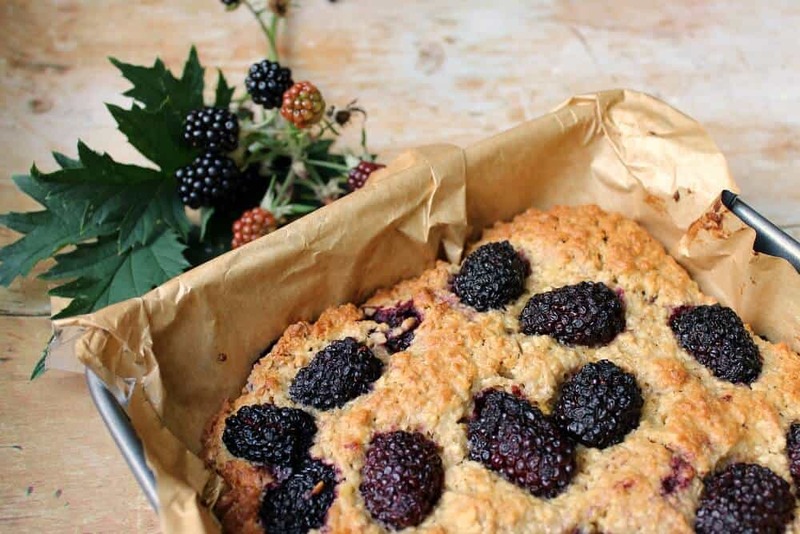 It’s a lovely bake to make as you want it to look rustic, so you don’t need to spend too much time on spreading the mashed blackberry layer too carefully. I just dolloped it in, spread it round and then topped with the rest of the oat mixture. Blackberries are also a big favourite here in that autumn and winter staple, the fruit crumble. I’ve found that the flavour of blackberries is enhanced by the addition of rose water, as shown in my blackberry and rose crumble. My oaty traybake is almost a tidier way of eating a crumble, in bar form. The good thing about the traybake though is that the fruit is unsweetened and really shines on its own. 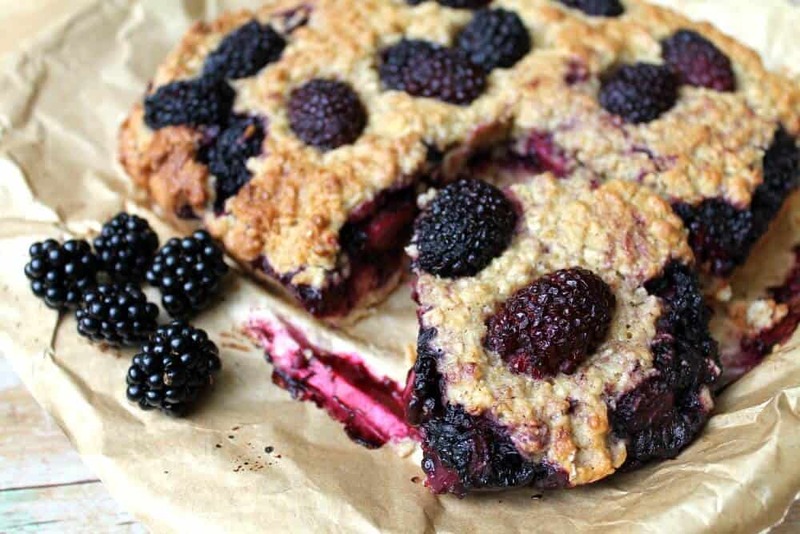 If the tart flavour of blackberries is a favourite with you, you must try this recipe. Get the recipe below and also make sure you check out my Recipe Index for loads more baking (and slow cooker!) recipes. 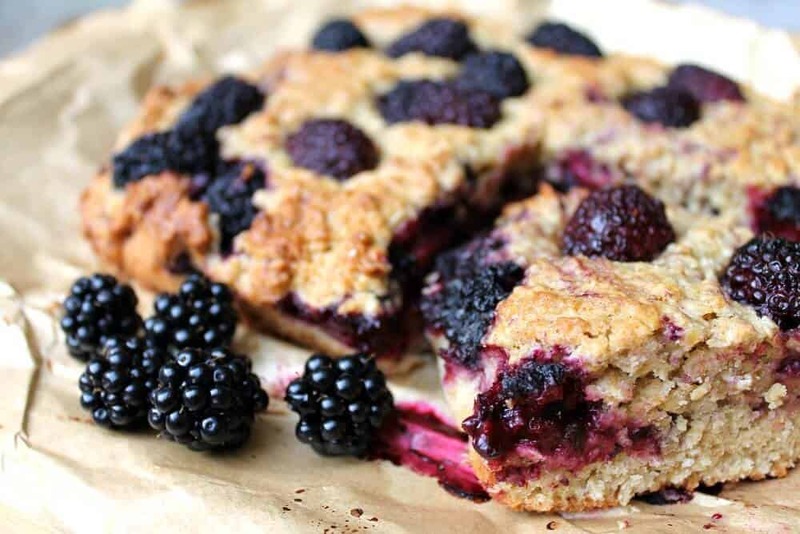 Pin this blackberry oaty traybake for later! Cream together the butter or sunflower spread and caster sugar until light and fluffy. Add the honey, eggs, and vanilla bean extract. Mix well. Pour in the flour and oats and mix well. Line a square baking tin (approx 20 cm) with baking paper. Preheat the oven to 180 degrees (fan). Spoon half the oaty mixture into the tin and spread into an even layer. Mash half of the blackberries in a small bowl with the back of a fork until you have a runny consistency. Spoon the mashed blackberries over the oaty mixture and spread around using the back of the spoon. Roughly spoon the rest of the oaty mixture over the blackberry layer and spread it gently. Scatter the remaining (whole) blackberries on top and press them in gently. Bake for 25 to 30 minutes or until golden brown on top and cooked through (check with a skewer). Allow to cool and then slice into squares and enjoy. 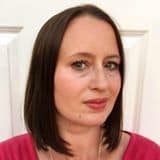 Thanks Kat, love your Eton Mess cookies! These look incredible! We’ve been picking lots of blackberries in the park too as well as getting them from the supermarket. My kids would also love this and they are definitely happy too if I bake! 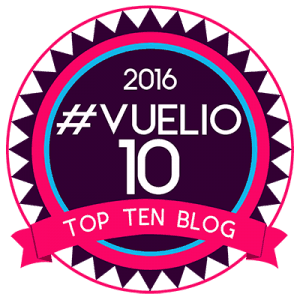 Tray bakes- blackberries – Oats – Yum!!! ooooh this looks so delicious Lucy. 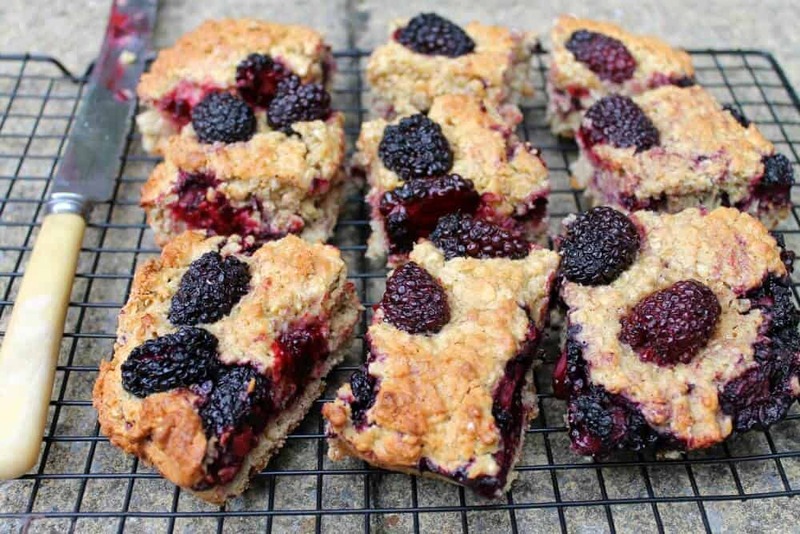 Such a perfect way of using up blackberries and I love the sound of a chewy flapjack.